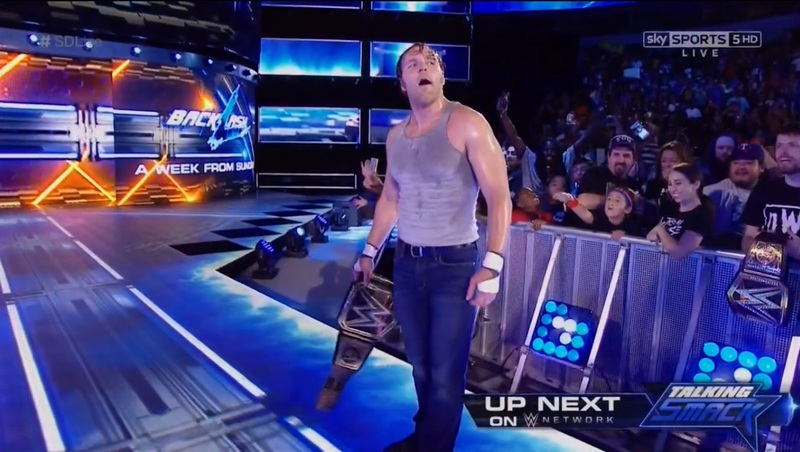 Just 12 days before BackLash 2016, World Champion Dean Ambrose was in action against Baron Corbin, but would that be enough to keep the excitement building for the 11th September supercard? This week's Smackdown Live main event was a decent enough clash, between World Champion Dean Ambrose and Baron Corbin, but I'm unsure about what the show closing angle involving #1 Contender AJ Styles was attempting to achieve. The match was perfectly fine stuff, nothing to get too excited about, but a well structured encounter in which Corbin looked comfortable in his first Smackdown Live bout since the start of the month. He's put together some nice spots, like the rolling out and directly back into the ring to take control and has moves like Deep Six, that he pulled out moments after a tasty suicide dive from The Lunatic Fringe. In the role he had to do here, that a bruising heel challenge for the World Champion, there's no doubt that The Lone Wolf has improved from the performer we saw leave NXT in April. After Styles had caused the DQ, throwing Ambrose over the announce table was where things went slightly south for me. Ambrose would hit Dirty Deeds on Corbin and then thwart Styles' Phenomenal Forearm attempt, leaving The Phenomenal One crotched on the top ring rope. It just didn't click for me and Ambrose playing it for laughs, didn't make it easy to believe that Styles was a serious contender for the belt and whilst that obviously isn't a problem for die-hard pro wrestling fans, it very well could be for the audience that WWE is competing for. The show's semi-main event was a solid tag team bout from the Women's division pitting Natalya and Alexa Bliss against Becky Lynch and Naomi, whilst a strong angle involving Carmella attacking Nikki Bella at the commentary table as the build towards the crowning of a new Women's Champion in an all-encompassing Six Pack Challenge on 11th September. The angle probably ended up overshadowing the bout, but with a fairly limited run time over an hour and a quarter each week, it makes sense to cram as much into the Women's division as possible in these early weeks to help to create a deep and rich sector. 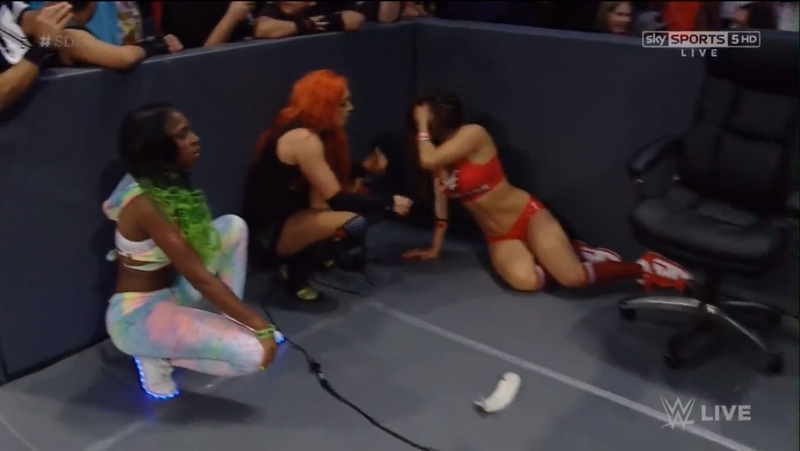 The contest was a strong, yet unspectacular tag bout, with all four women working well together and getting good reactions from the Dallas crowd. Natalya and Bliss seem to have good chemistry as duo, whilst that's also present in the worked between Natalya and Naomi, however the issues between Bliss and Lynch do come across as a little forced with their in-ring confrontations being the weakest action of another stellar bout. Bliss getting a second pinfall over Lynch, following the distraction of Carmella at ringside, seems to suggest we'll be seeing more of those two, so I'm hoping that we get to see them click heading out of BackLash. As well as being involved in the show closing angle, AJ Styles would also be in action this week as he collided with an Apollo Crews who struggled for screen time since the brand split (despite earning an Intercontinental title shot at SummerSlam on the first Smackdown Live!). The match was decent fair but not in the range that many will know Styles and Crews could produce given the right opportunity. After a physical opening exchange, two spots in particular stood out in the 8 minute bout, a lovely moonsault off the apron by Crews as well as the former Dragon Gate catching a diving crossbody from the Phenomenal One and turning it into a Samoan drop. Outside of this the match was as smooth as you'd expect, but lacked the change of gear that would have picked it out as a must-see. The finish came off as a bit flat, coming directly after the samoan drop spot, with Styles pulling Crews across the ropes with a stunner, before hitting a Phenomenal Forearm to pick up the win. Crews v Styles was probably on the same level as Ambrose v Corbin in the main event, but I can't help feeling that putting the two bouts together and having a tag main event (Styles & Corbin v Ambrose & Crews) would have created a much more satisfying action. Rounding out the top of the card and arguably the best part of the show was Bray Wyatt's "Sermon for the Serpent", which addressed new rival, Randy Orton. I've always found The Eater of World's fascinating to listen to, because his character allows him to take a different tone and style with his promos than the majority of WWE's roster, he has the ability to pull something out of nothing, but it's when he has something to get his teeth into that he's at his best and that was on display here. He weaved the characters stories together well, discussing Orton's Viper gimmick, as well as the idea that he hears voices in his head, which all made for perfect fodder for Wyatt's cult leader character. To help the words, the segment was shot beautifully with the, now former, Wyatt Family leader sitting in his rocking chair with the cameras pointed upwards from the ring apron, creating an ominous look that got over Wyatt's size well. The closing moments where Orton would appear, and eventually attempt to fight Wyatt in the ring, were well timed and made sure that the moment The Viper got in the ring the crowd was buzzing to see the pair scrap, only for Wyatt to pull off his disappearing act for the second week in a row. With a match between the pair confirmed for 11th September, we won't have to wait long for one of the biggest first time matches (broadcast, at least) that WWE currently has. 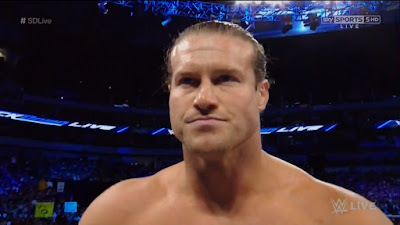 In the opening segment, Dolph Ziggler would end up substituting for Daniel Bryan in an angle that began on last week's Talking Smack ending up getting an Intercontinental Championship match with The Miz at BackLash for his troubles. As much as it didn't have the fire that the Bryan and Miz confrontation had and as much as it showed that neither guy had particularly progressed since 2008, I felt like both (as well as Maryse) put in positive performances, in a well structured exchange. Miz may have fluffed a couple of his line, but it came across as passion because he genuinely looked pissed off that people perceive him as a "soft-style" coward, whilst The Show-Off came through the curtain like he'd just downed a can of Monster and bought just as much passion as Miz did to proceedings. The fact that Miz ended up walking away, whilst Ziggler challenged him to a fight, and then had to "held back" by Maryse, played up the coward gimmick well and I'm interested to see where the feud goes next week heading into BackLash, because they'll have to be creative to keep it going. With the fact the pair have had at least two TV singles matches a year since 2012 (a massive six in 2014, four already in 2016 and a grand total of SEVENTEEN) will make it hard for the pair to produce something new, but I'm willing to wait and see what they can pull out. The third Quarter Final in a tournament to crown new Tag Team Champions, saw The Hype Bros (Mojo Rawley & Zack Ryder) advance to the Semi-Finals over The Vaudevillains (Aiden English & Simon Gotch) , in an unsatisfying contest. Giving the opening contest less than three minutes was never going to produce a tag classic and the clash ended up feeling a bit of an extended squash match. The main problem for me when watching this, is that the potential for a feud between the two teams is obvious, with The Vaudevillains being the old-school entertainers, whilst Hype Bros are an upbeat neon clad ball of caffeine. An opening exchange that saw Ryder hit a front dropkick through the 2nd and 3rd ropes on Gotch, leading to English to nail a sweet running neckbreaker onto the floor, showed that the potential wasn't just in the character juxtaposition, as well. It's seems odd to have three (currently) babyface teams advance to the semi-finals and weakens any potential championship feud that will definitely need heel teams like The Vaudevillains, Breezango or The Ascension. In a move away from the regular WWE production style, there was an intriguing segment in which Renee Young went to interview Heath Slater in the single-wide trailer that he calls his home. We'd meet Slater's wife Buelah and learn that the tag partner that the One Man Band acquired last week, 2 time ECW World Television Champion Rhyno, was already best friends with Slater. The undoubted star of the segment was The Man-Beast who has some wonderful comic timing and was given the funnier of the jokes involved in the skit. However I don't feel like the segment quite came together as it could have, with Slater lacking some of the charm he's had on previous appearances on RAW and Smackdown Live during the Free Agent angle. If these types of segments continue then I'm sure they'll become much more comfortable as WWE works out their particular style for them, and as a first attempt this was definitely watchable and contained a couple of funny moments, but it wasn't quite a home run either. Slater and Rhyno became the Kings of the undercard as they also took part in the Quarter Finals of the Tag title tourney, taking The Headbangers (Mosh & Thrasher). Yep, the Headbangers returned for their first WWE appearance since losing to the Dudley Boyz on an episode of Jakked in May 2000! Whilst barely longer than the Hype Bros v The Vaudevillains bout, I found this clash a much more enjoyable outing. Mosh & Thrasher looked surprisingly good, with Mosh pulling out a springboard crossbody to knock Slater off the apron as well as a brilliant Stage Dive [powerbomb and diving leg drop combination] for a false finish. The dynamic of Slater & Rhyno as a duo was presented well, with the former Nexus member struggling, before The Man-Beast dragged him over to their side of the ring for a tag and nailing a Gore for the win! As they go on to face The Hype Bros in the semi-finals, I'm hoping we get to see Beauty and the Man-Beast advance to the 11th September final as they present by far the most interesting story for that match against either American Alpha or The Usos. This was an episode that had a lot of good ideas, some which paid off like the Bray Wyatt and Randy Orton segment, some of which were disappointing but still entertaining like The Miz and Dolph Ziggler's altercation, some of which could have been improved upon with a little bit more though, like both Dean Ambrose v Baron Corbin and AJ Styles v Apollo Crews and some of which were brave and different like Renee Young's trip to Heath Slater's home. The strongest encounter was probably the under the radar Alexa Bliss & Natalya v Becky Lynch and Naomi clash that was aided by a strong angle between Nikki Bella and Carmella. While I have a number of thoughts about next week's go-home show for BackLash, I'm mostly hoping that the talented tag team division finally gets the chance to show-us what it can do, after a strong twelve man tag bout on the SummerSlam Kick-Off show. The two semi-finals have tonnes of promise with The Hype Bros taking on Heather Slater & Rhyno and a highly anticipated confrontation between American Alpha and The Usos, I'm just wishing that both bouts are allowed to live up to their potential to set up a Final that the audience can look forward to. For those counting, this week puts RAW level with Smackdown Live at 3-3 in their week to week ATPW Scale Rating battle since the Draft.